Immanuel Wallerstein one of the most prominent neo-marxist schloar in this field. His major analysis come in (1974 1979 1983, 2004). 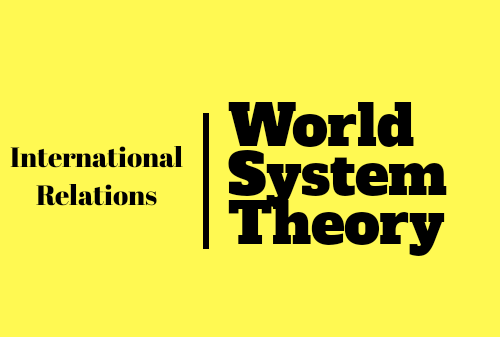 World systems need not physically include the whole world; they are unified areas characterized by particular economic and political structures. The concept thus ties economics and politics together: a world system is characterized by a certain economic and a certain political structure with the one depending on the other. ✒️ In human history, there have been two basic varieties of world systems: World - Empires and World-economies. 1. World 🏰empires:- such as the Roman Empire, political and economic control is concentrated in a unified centre. The capitalist world economy was established in ‘the long sixteenth century’ (1450 - 1694) was based on an international division of labour that covered Europe first, but soon expanded to the Western hemisphere and later also to other parts of the world. Within this division of labour, a process of specialization took place; this happened in a somewhat accidental way at first; for a number of reasons north-west Europe was in a better position to diversify its agriculture and to connect it with industrial advance in textiles and shipping. The capitalist world economy is built on a hierarchy of core areas, peripheral areas, and semi-peripheral areas. CORE AREAS :- The core areas contain the advanced and complex economic activities (mass-market industries and sophisticated agriculture). Furthermore, these activities are controlled by an indigenous bourgeoisie. PERIPHERAL AREAS:- The Peripheral areas are at the bottom of the hierarchy; they produce staple goods such as grain, wood, sugar, and so on. They often employ slavery or coerced labour; what little industrial activity exists is mostly under the external control of capitalists from core countries. they are a middle layer between the upper stratum of core countries and the lower stratum of peripheral countries. ✒️ In the process of unequal exchange, tensions are created in the system The semi-periphery has an important function in this regard It provides an element of political stability, beg: the core countries are not facing unified opposition; the semi-periphery acts as a buffer a, shock absorber. At the same time, the world economy is not entirely static; any single aim of the system may change place from periphery to semi-periphery, from semi-periphery to core, and vice versa. Furthermore, the types of commodities involved in core and peripheral economic activities respectively are subject to dynamic change. Technological advance means that the concrete content of what is ‘advanced economic activity‘ always changes. At one point it was textiles; in a later phase it was industrial machinery; today, it is informationand bio-technology together with financial and other services. But Wallerstein emphasizes that the capitalist system as such does not change: it remains a hierarchy of core, semi-periphery, and periphery, characterized by unequal exchange. ✒️ Wallerstein sees the end of the Cold War and the destruction of the Soviet Bloc as a consequence of the development of the capitalist world economy. However, the long-term prospect is the demise of the capitalist system, because the contradictions of that system are now unleashed on a world scale. Success, not failure, is the real threat to global capitalism; when the possibilities for expansion are all used up, the never-ending quest for more profit will lead to new crises in the world capitalist economy which sooner or later will spell its transformation.